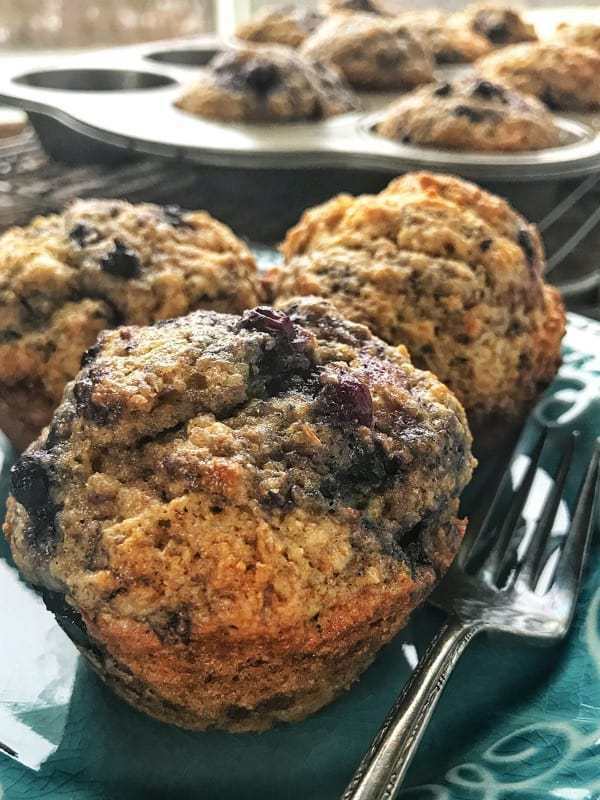 These wholesome blueberry muffins are made with a few simple ingredient swaps that make it a lighter and more wholesome recipe. They will quickly become your go-to homemade blueberry muffin recipe. 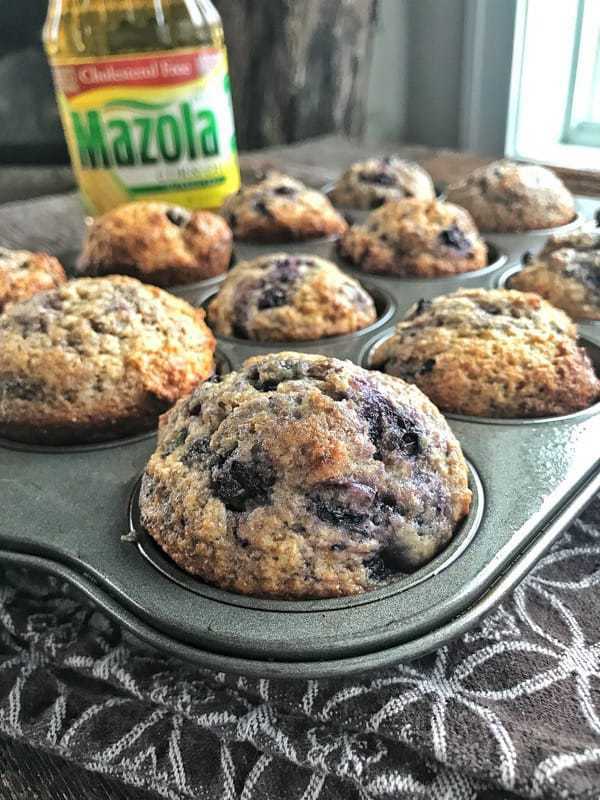 Today, I’m sharing a fantastic blueberry muffin recipe using several swaps to make them lighter and nutrition packed. Keep reading to find out all four swaps along with tips on how to make the perfect lighter blueberry muffin. Swap #1: Instead of using butter, use corn oil. A recent study has found that adding Mazola® Corn Oil to one’s diet resulted in lower cholesterol levels than Coconut Oil. A previous study found that corn oil can also help lower cholesterol more than extra virgin olive oil. To learn more about the study, see Mazola.com. Mazola® Corn Oil is an all-purpose cooking oil that is a smart heart-healthy choice for your family. It is also made of 100% pure oil with no additives and has a neutral taste, so the great flavor of your food comes through. All Mazola® oils are cholesterol free. In my home, Mazola® Corn Oil is a pantry staple. It’s called out by name on many recipes passed down to me from my late mother in law. I found it interesting to read studies Mazola® Corn Oil did on the benefits of corn oil in our diet. Along with resulting in lower cholesterol levels than using Coconut Oil, a clinical study showed Mazola Corn Oil reduces cholesterol 2x more than extra virgin olive oil. To learn more about this claim, see Mazola.com. Swap #2: Rather than whole milk, use plain Greek yogurt. Greek yogurt is a style of yogurt that’s been thoroughly strained of its whey, resulting in a thicker consistency than regular yogurt. Greek yogurt is naturally lower in sugar than unstrained yogurt because the straining process reduces the amount of lactose. Greek yogurt is also higher protein and lower in carbs than regular yogurt. More reasons to make the swap? Greek yogurt’s creaminess helps keep baked goods moist, it provides a delicious tanginess, and its acidity helps activate baking soda which helps make baked good light and fluffy. Fruit purees are a simple way to cut back on added sugar in baked goods. You can safely replace 1/3 – 1/2 of the called for sugar in a recipe with a fruit puree. Ideas include mashed bananas like found in this recipe, applesauce, or pureed pears, figs, or dates. Studies show that 3 servings a day of whole grains can significantly decrease the risk for heart disease, certain types of cancer, and diabetes. Even just one serving of whole grains per day show reduced risks, just not as pronounced as higher intakes. Due to their fiber content, whole grains have a more filling effect as well. If your family is not used to using whole wheat flour, start by using half white flour and half whole wheat flour. Gradually switch to all whole wheat. When using all whole wheat flour, let your batter sit 15 minutes before baking, this results in a more moist muffin. 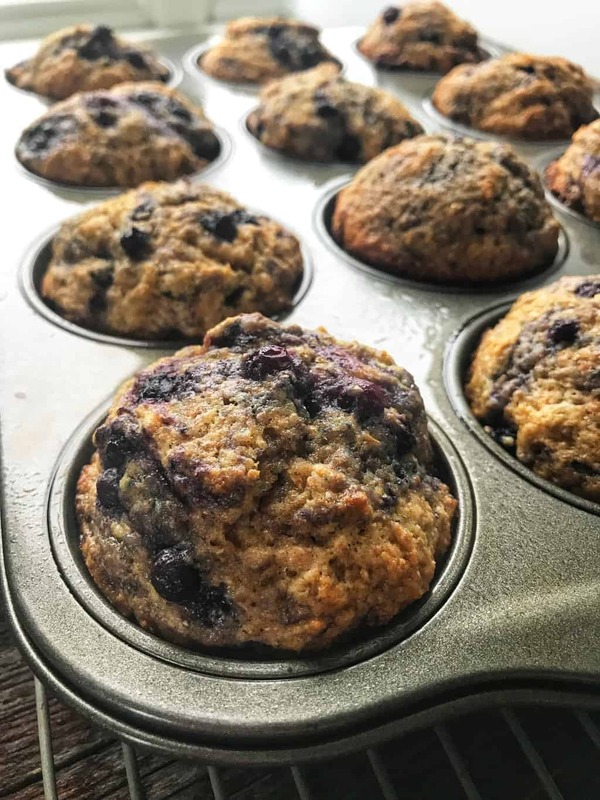 Homemade blueberry muffins are easy to make, but they do require the right amount of wet ingredients to dry ingredients – and the quantity of blueberries matters in the end result. 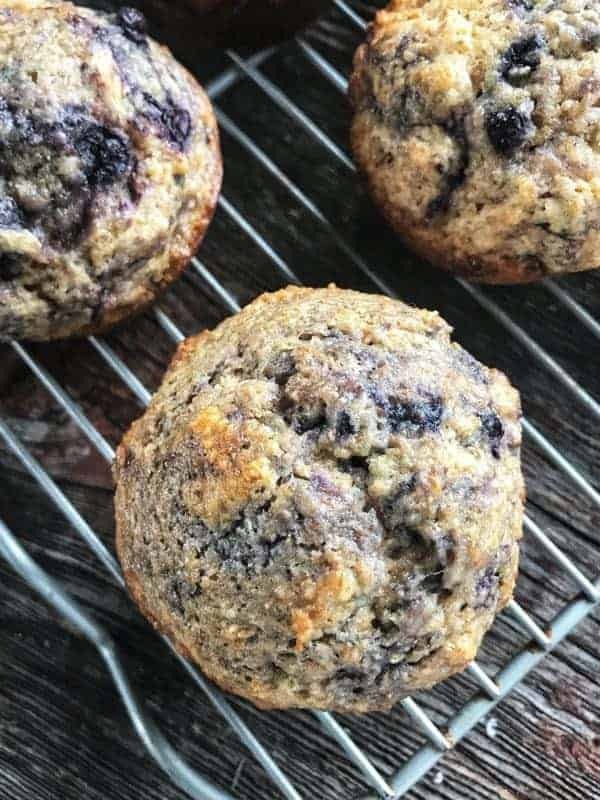 In my younger years, I’d add extra blueberries than a recipe called for to pack the muffins with this highly nutritious ingredient. Well…. I quickly found that just doesn’t work. Those of you who have tried this know what I mean. It means super soggy muffins – but with lots of blueberries. 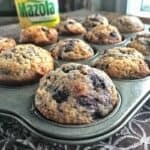 Whole wheat blueberry muffins with frozen blueberries are not hard to make, but they do require a few pieces of knowledge to make sure they turn out every time. In days of past, flour was sifted not only to aerate but to separate out any bugs or left hind husks. Nowadays, flour is processed more thoroughly and this is not necessary. However, a simple whisking is needed to add air and combine the dry ingredients. Baking is a science, and because of this, there are certain rules that need to be followed. Over mixing batters and dough will toughen and strengthen the gluten in the flour which yields tougher baked goods, not the light and fluffy product you desire. By mixing the dry ingredients together first, and then doing the same with the wet ingredients, once combined, very little mixing is needed. The less you mix the flour the less gluten has a chance to develop and you end up with a fluffier and light end product! 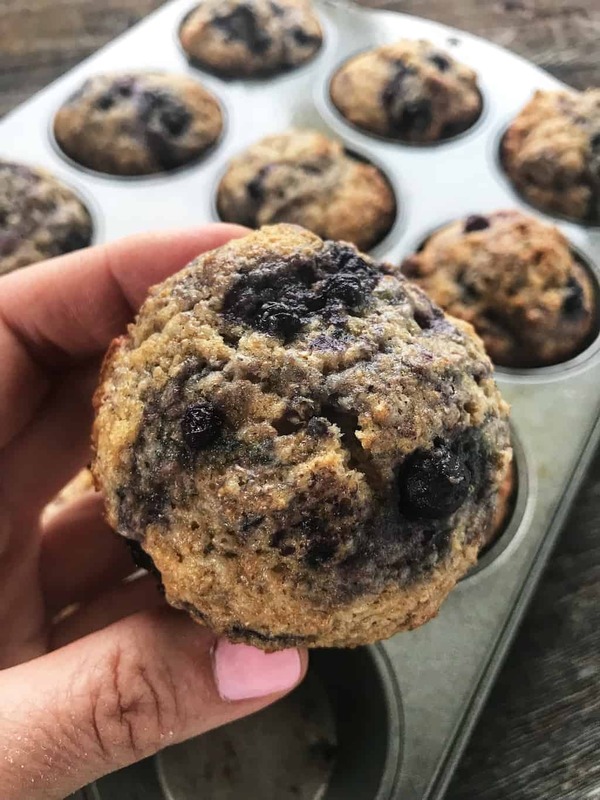 This easy Blueberry Muffin recipe is made with 4 simple swaps that boost nutrition yet taste amazing. 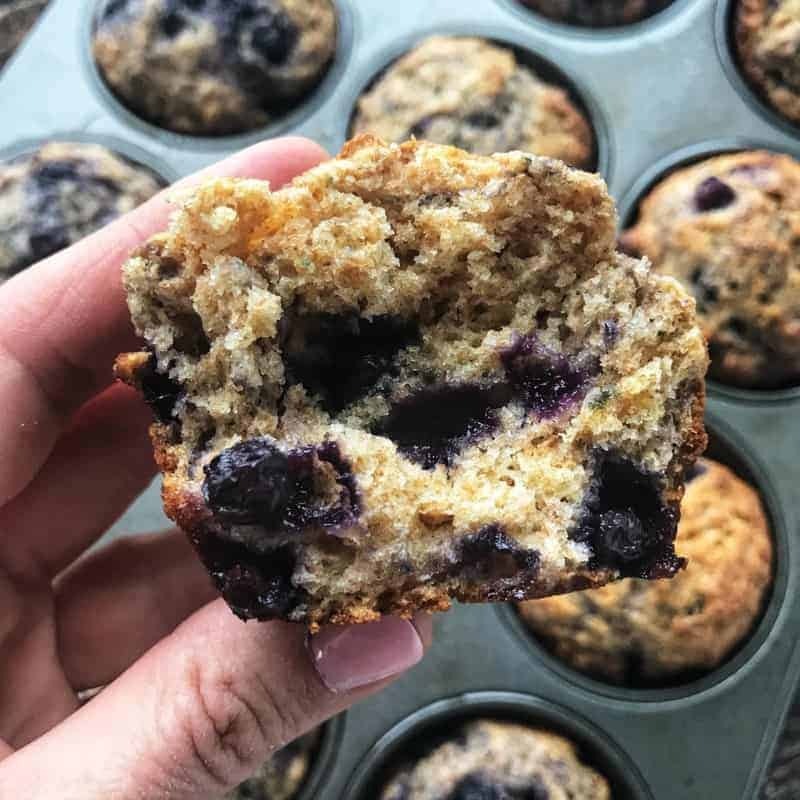 Made with Greek yogurt, whole wheat flour, and mashed bananas, these muffins are the perfect breakfast or after-school snack idea. Preheat oven to 400°F. Prepare muffin tins with non-stick cooking spray. In a medium-sized bowl, whisk flour, sugar, baking powder, baking soda, and salt together. In another medium-sized bowl, whisk yogurt, mashed bananas, eggs, oil, and vanilla. Add wet ingredients to dry ingredients, stir until just blended. Place frozen blueberries in a small bowl. Measure 2 tbsp. of the dry flour mixture, stir into blueberries. This helps prevent the berries from sinking to the bottom of the muffin. Divide batter into muffin tins. The recipe makes 18 large muffins or 12 large & 12 mini muffins. Bake at 400°F for 20 minutes or until a toothpick inserted into the center of the muffin comes out clean. Check mini muffins after 12-15 minutes. These muffins are the best! !